The 2019 Wassail (our eighth!!) will be held on Saturday 5th January starting at 6.30pm in the farmyard at Church Farm, Dunton. Take the road to the left of the March Hare pub (if you are looking at it). This is Church Street and Church Farm is at the end of this road, just behind the church. Our wassails are very much community affairs with a number of village groups involved with the event. We have soup and hot dogs from Dunton Community Garden, mulled cider from Franklin's Cider, Dancing from Letchworth Morris Men and Bedford Morris Men, vocal entertainment from Singtastic (Dunton's very own choir), a mummers play from the Brafront Guizers and a traditional music session in the March Hare pub. Who would think you could have so much entertainment in one evening? Wrap up warm, bring a torch, a saucepan lid and a wooden spoon. Once we have hung toast soaked in cider in the trees in the orchard and sung a couple of wassail songs we toast the apple trees then make as much noise as possible to encourage the trees to bear as many apples as possible next year. 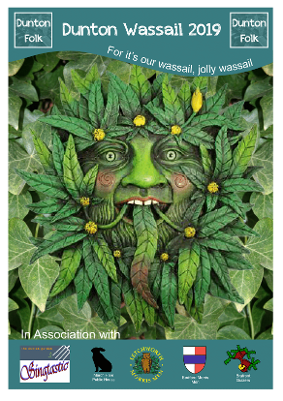 Wassail! Wasail! All over our land!